Beuil les Launes is a picturesque medieval village in the iconic French Alps. Offering a wide range of sports, culture and things to do it is a popular, year-round location for holidaymakers. Aside from the fantastic skiing opportunities, there are plenty of outdoor activities as well as tourist hot spots to visit. Known as the gateway to Mercantour National Park, Beuil Les Launes is arguably one of the most picturesque areas in France. Surrounded by a red rock landscape and dotted with snow-capped mountains, it is truly an awe-inspiring location of extreme natural beauty. Cross country skiing is popular in winter, while in the summer hiking and water sports are widely enjoyed. The diversity of things to do and the distinct seasons, make this a wonderful place to invest in and a holiday home in Beuil Les Launes will offer endless possibilities of things to do and see. Whether visiting during peak skiing season or making a summer trip, you are sure to find plenty to do in this wonderful French resort. Families are very welcome as are couples and groups, with plenty to offer visitors of all ages and interest. Isola is one of the local parks offering extraordinary views over the lake and a range of trails suitable for all fitness levels. Enjoy the amazing views no matter the season and stop for a picnic as you walk. There is also a beautiful waterfall which makes a fantastic reward for all that hiking. There are a number of beautiful cathedrals and castles in the region displaying original artworks and artefacts. These ancient spaces make a fantastic day out for visitors of all ages and will ensure children enjoy learning on their trip. The area is also within easy reach of Nice so that those looking for a day at the beach, can easily have one with Beuil les Launes as their base. The local people are extremely friendly and welcoming to visitors, particularly families. Local restaurants celebrate fantastic local ingredients and proud heritage of delicious cuisine. Make the most of small, local restaurants to taste the true flavours of the region. The area also boasts plenty of friendly bars where you can taste French wine and other delicacies. There are also regular festivals and celebrations where you can enjoy music and dancing while learning about the regions unique culture and history. Easter is a particularly good time to visit and enjoy the celebrations. The region is ripe for investment as its ever-growing popularity means the region is being developed and property prices are growing. Recent investments offer a variety of options, with apartments averaging a quarter of a million euros and traditional ski chalets selling upwards of two and a half million euros. Those looking for larger investments will find that those wishing to develop new apartment complexes will be well-received as this popular region is always looking to welcome more visitors to enjoy its bountiful ski slopes and astonishing natural beauty. Fantastic skiing is available in Beuil les Launes from September to April, when snowfall is at its heaviest on the mountains. 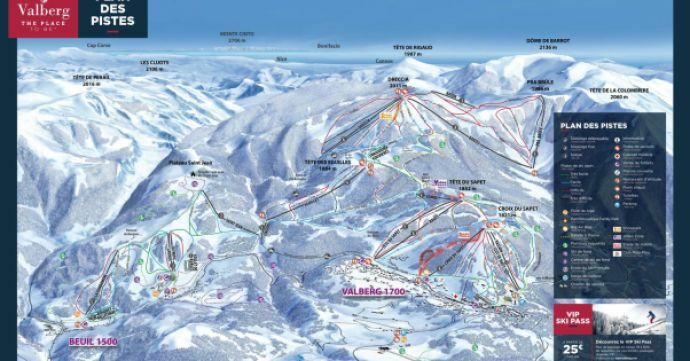 There are 90 ski runs stretching up to 2100m and offering a range of difficulties from easy to those routes which are only suitable for the most advanced skiers. There are 26 lifts on the slopes which are able to take 22,000 skiers per hour, ensuring that you can spend as much time skiing as possible, rather than waiting for a lift. You can find out more about the regions snow and weather at our Beuil les Launes resort guide, including an up to date snow report. There is also a ski park where snowboarders and skiers can enjoy a different challenge to the many mountain trails. Cross country skiing is also available and there is a ski school for newbies and youngsters to get to grips with this fantastic sport. This ever-popular resort has fantastic transport links with the rest of Europe. As the town is so close to Nice, travelling by train is a great option. Travelling from London by train or aeroplane is an easy way to access this fantastic region. Many skiers will also choose to travel by car as this will allow you to bring as much specialist equipment as you like. The roads around Beuil les Launes are well maintained and offer some of the best panoramic views of the region. A car will also be helpful for visiting tourist attractions further afield, including the beautiful coastline 70km away. Beuil les Launes is a fantastic location for families, couples and groups to experience the fantastic cuisine and culture of the French Alps. It truly is far more than a ski resort.